A good explanation of the differences. OK. I'll accept that my Dutch Ovens were called Bake Kettlles. Impressive research. We all owe the people that simply for the love of historical accuracy dig and dig for these kind of things. But I'll still call mine Dutch ovens. Except maybe at 'vous'. Just to avoid the awkward and sometimes futile (or raised eyebrows) explaining it to people who have only seen "Bake kettles" in BassProShops. It's like when my Grandma was alive and we were at a family get together. After a few snorts she would declare she was having a gay time. Us kids would laugh. She didn't really get it. She also called the old odd guy down the street "queer". As in odd. Thanks for the education on the cookware. I'll show off my knowledge at my next rendezvous. The last comment details an 1850 source calling a DO, a DO.(?) it is an interesting article, but like a good Dutch Oven cobbler leaves you wanting a little bit more info. My question is always the same: How do you know your sources were correct and accurate? What if they picked up the wrong term somewhere and perpetuated it in print? Damned thread counters. I will call mine a Cast Iron Jimifribitz. Or maybe a Hoodikai. Or a big heavy iron thing. This thread reminds me a lot of the thread that PW started sometime back on the different terminologies involving the use of firesteels/ferro rods and what those words mean to different individuals. I see reference to the term 'bake kettle' a lot in old journals and books from the Colonial era and the years following......up even to the period of the westward expansion via the Mormon and Oregon trails. Something seems to have changed about the time of the cattle drives out of Texas and the Civil War era. Then is when I started noticing printed references to the three-legged iron kettle changing from 'bake kettle' to 'Dutch oven'......SOMEBODY started the confusion, but I really don't know and can't pinpoint the who, when or why of of it all, either. As far as I know, the cast iron, 3-legged skillet with the long side-handle instead of a bail-type handle has always been called a 'spider,' but I see references to tri-legged fireplace 'trivets' being referred to as 'spiders,' also. For me, the tinned sheet-iron reflector-type baker that most of us refer to today as a 'reflector oven' was first referred to as a 'Dutch oven' by some older ladies that were in command of the big walk-in type fireplace at the reconstructed Fort Atkinson (1819-1827) just north of Omaha, NEBRASKA. At the site that Lewis & Clark recommended as an ideal spot for a fort for negotiating with indigenous Missouri River Indian tribes, it was the first fort west of the Mississippi River. Those ladies that were reenacting the laundresses, kitchen workers, cooks, bakers, etc. we're VERY well-versed in the terminology of the era, so at that time at least, those tin baking utensils were still being called Dutch ovens. Language evolves over time. Sedans and coupes meant different things than they do now. I think we should go with the common parlance on this one. I've heard of trivets referred to as spiders as well. Also, I've hear the term used for a lid stand for what we have been calling a "Dutch Oven". All the folks who teach English tell us that languages evolve. There was Olde English, Middle English, Modern English, and American English. Terms change too. Except if you do historical interpretation. In that case, you must research every variation and nuance to determinewhat was said hundreds of years ago. Well, if they didn't write it down, maybe it ain't that damned important. When my dutch oven or bake kettle is full of green chili stew it calls me. Ok. What does it call you? I wouldn't take no sass from a big mouth kettle. 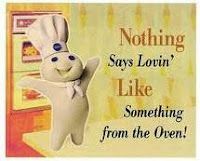 Like the Pilsbury Dough Boy, my 'bake kettle' always says, "Nothing says lovin' like something from the oven!" Whatever you call them, you know you're hooked when you have a perfectly good oven, stove, toaster, and microwave inside and you're sitting outside in FL's 97 degree heat rotating a DO dripping sweat and slapping skeeters for whatever goodness will emerge from the iron. Oh, so true.....invariably, I get requests from people and groups of people to "do a Dutch oven meal" during the hottest and most humid time of the year. Right now and in the Fall of the year is when it is most comfortable for the campfire cooks among we NEBRASKANS! Call it whatever you want, just don't call me late for supper/dinner/lunch! Thanks Wolfy, I was trying to think of a descriptive that would fit what I wanted to say and be subtle enough not to sound mean. I understand that accuracy is important on some levels, but I question that it's necessary all the time, if you're writing a how to book, or a history book it's one thing, other times not so much, one thing I always hated at the 'Vous was damned thread counters, I believe that more newbies were discouraged away from the 'Vous by thread counters than anything else. Dutch Oven works for me. I think a lot of 'vous veterans forget how utterly overwhelming the first couple 'vous are. While I agree wholeheartedly with both of you guys on the intimidating, snobbish behavior demonstrated by the typical family-oriented rendezvous 'thread-counter,' there ARE appropriate places for them, too. Historical reenactments, American Mountain Men events, demonstrators at National Historic Parks and their ilk are the perfect niche for these types of folks. They revel in using the most accurate information possible and delivering it to the general public. There's absolutely nothing wrong with that as far as I'm concerned. Those types who use their SOMETIMES accurate knowledge to intimidate or embarrass someone or a 'newbie' at a family type of rendezvous should be, as Del Gue would say, "Slit from crotch to eyeball with a dull deer antler!" I met full fledged civil war reenactors here in FL once. I had sweat through my t shirt and soaked the front of my shorts. They stood there in full wool dark (well the Union guys did) uniforms patiently answering questions from us ignorant folks before (I think) the battle. They let those that wanted to feel their sleeves. Their shoes and boots must've been full of sweat. Exactly! One can't help but wonder why the Civil War drug on as long as it did.....what with combatants on both sides donning heavy wool uniform parts and typically battling in some of the warmest and most humid sections of the country! No wonder Jeremiah Johnson headed for the Wasatch range after the war with Mexico! Dutch Ovens Chronicled is the book referenced in the Wikipedia article on dutch ovens, which claims the name comes from the superior dry sand casting technology used in the Netherlands being imported by England in the late 17th c.
Apparently, the same book also credits Paul Revere with the addition of legs, as well as the rimmed lid. Following the link to Abraham Darby is interesting as well. I have not read the book, anybody done so? I have that book in my library......surpri sed? You Have A Library ? Moe, He does indeed. But most of the books have been colored in. According to Heather, YES! She reads a lot, too, but most of her reading for enjoyment consists of novels.....she gives most of them away for others to enjoy. On the other hand, I keep almost ALL of mine because my reading material consists of historical reference books, technical reference material on subjects that I am trying to study & learn more about, etc. Just the newest and most complete multi-volume, hard-bound set (annotated by Dr. Gary Moulton) of The Journals of Lewis & Clark, which includes a full-sized, bound volume of all of Captain Clark's hand-drawn maps of the journey from the Wood River encampment to Fort Clatsop and both routes back......that heavyweight set of books alone, takes up over 4 feet of shelf space! They will be going to our local Carnegie Library for the benefit of other students of the expedition when I croak. P.S.......You're a funny guy, Bob! He has been on a roll lately. Nothing that made me actually L O L but close. If I look back at the references in QC's OPost, were those written by Dutch descendents. Could be the Dutch called them bake kettles and everyone else referred to the pots as Dutch ovens. There is some validity to that idea, as well. Those 'bake kettles' were supposedly first traded in large quantities in this country by the early Dutch traders. Thus, they were referred to as 'Dutch' ovens. Clearly, different people in various places called them different things. We cannot assume even a scholarly whitepaper on the etymology of cooking utensil terms is 100% accurate. We don't know everything that transpired in the last 200 years. Maybe not all variants have been documented. Maybe those Nebraska farmers are fooling around with the books. Nope.....just reportin' on what I read. Please don't be offended, wolfy. It was just a good-natured rib. NO worries, Quench! If I couldn't 'take it,' I couldn't 'dish it out,' either...........an d we all know I consider that to be one of life's greatest pleasures! I wasn't trying to be definitive QC. I thought the DO being cast in 18th c. Netherlands was perhaps an interesting tid bit. However, if Revere did put the legs on, and design the lid, that is really interesting imo. That would make it more of an American Oven. It'd be cool to see pre-Paul pot with legs and/or lipped lid. Or a similar type of legged pot from another land/culture from before mid 1700's. Wolfy, can you look that up in your edition? I'd like to know the authors sources for the P. Revere innovations. OK, Unk....as requested, I pulled out my copy of John G. Ragsdale's DUTCH OVENS CHRONICLED: THEIR USE IN THE UNITED STATES printed by The University of Arkansas Press. The Wikipedia article you linked to draws heavily on Ragsdale's research, however he makes no mention of the Colonial Urban Legend which claims that Paul Revere devised the '3 legged/rimmed lid' additions to the camp Dutch oven that we are all familiar with today. I won't go into Darby and his contributions to the improvements made to the 'bake kettle' because that information is easily accessed by everyone, simply by doing a Google search of DUTCH OVEN. I too, have read in various places that Revere was the genius behind the modifications to the basic cast iron kettle. Whether that is fact or fiction, I don't know. You know how that stuff goes, though.....one guy writes it in a book and others repeat it. Whether there is any solid, definitive early source for that claim, I have no idea. I'm certain that everyone has also come across the claim that Lewis & Clark emphasized in their journals that the Dutch oven was one of the most prized & valuable pieces of equipment that they took with them on the expedition. BALDERDASH! As I mentioned before, I have a complete set of the most scholarly-annotated & recently-edited JOURNALS OF LEWIS & CLARK, which also includes all of the journals extant that were kept by those men that were literate and who were also members of the expedition. The ONLY reference to a Dutch oven in ALL those thousands of words was when one of the men, I believe it was Sgt. Whitehead, wrote in his journal that they left "one of the Dutch ovens" in a cache-pit at the lower end of the portage around the Great Falls of the Missouri River. They unearthed that cache on the journey back down the river a year later, but the high water in the Spring had washed part of it away.....no mention of whether that oven was recovered or had been lost. I looked.....I couldn't find it, either. Given that three legged frying panos (spiders) were in use for hundreds of years, I would doubt that any one person could be given credit for legs on a cast iron pot. Ragsdale claims in his research that the 'tin kitchens,' 'reflectors,' 'tin bakers' or 'hasteners' as they were also called, were sometimes referred to "MISTAKENLY" (his word) as Dutch ovens, in essence, nullifying the information that Quenchcrack revealed in the opening post of this thread. I guess we have to take all of this stuff we read with several of the coarsest of grains of salt! Why would we believe Ragsdale when we do not believe other researchers? By what criteria do we judge 200 year old written comments uttered by people we cannot interview? Choose a name that you are comfortable with and go with it. For as long as we live we can explain ourselves, after that, who cares? Ragsdale cites his sources for his research, both in the text and in footnotes.....but you're right, this is foggy territory at best. That's the trouble with things like this.....the most common, everyday and mundane items that were used the most often were hardly mentioned in diaries and journals because they didn't consider it important or believed that everyone knew what they were talking about anyway, so why repeat it? Well that attitude about historical writings would invalidate all historical data passed down since the Republic was founded. While the subject of this thread is trivial, the position that since we cannot interview them so disregard what they said, would apply to everything. Should we not believe what historians who are dead wrote about events at the Alamo? At Gettysburg? At Sante Fe in 1847? There are sharply differing accounts on many historical subjects. As an engineer, I was taught if something looked fishy, challenge the data, if the data looks ok, challenge the math, if the math looks ok, challenge the interpretation, if the interpretation was wrong, do your own and let your peers have at it. Yes, almost everything can be questioned but we often have no better information with which to challenge it. But if we assume everything written in history books is correct, we will never make progress toward the real truth. I think it is time for this thread to come to an end. I don't think we need to do that, QC......just trying to add a bit of mirth to a subject that probably bores everyone, except us, to death. It ain't boring. I learned what a Dutch oven was or is. I learned what a Dutch oven isn't or wasn't. I have a brand new warming thing waiting for its first batch of biscuits and am desperately looking for a break from spraying weevils and weeds. Interesting, good post. The enclosed dutch oven/reflector oven is something i would be interested in purchasing. Knowing what a bake kettle is adds to picture when reading about the fur trading days and other western history. A hand made, tin reflector oven will cost you a car payment. That is why those nifty cast iron pots with legs and flat lids (call it what you want) are so popular. I think the underlying reason the cast iron bake kettle is more popular than the 'tin kitchen' is soley because of its versatility. Boiling, sauteing, baking, frying or any other method of cooking you use to cook at home in your kitchen is possible in the cast iron vessel.....not so for its overpriced competitor. Maybe a better question would be.....what CAN'T you cook in a cast iron 'bake kettle' or Dutch oven?